Sovereign Lake had a record opening weekend, with 1,001 day tickets sold, and all three days of the long weekend setting records. As usual in the early season, there are visiting teams. The BC Talent Squad was here for the weekend, along with Telemark and Larch Hills. The Alberta World Cup Academy arrived on Monday for a week of skiing. 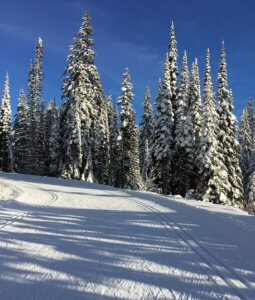 The ski trail conditions are great. Snowshoers are still waiting for a bit more snow. Do your snow dance!